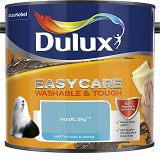 Dulux Easycare Washable & Tough Matt with unique stain repellent technology. It is 20x tougher than standard Dulux Matt so you can remove stubborn marks without damaging the paint on your wall, keeping your home looking great for longer. Dulux Easycare has the same Diamond Tough technology of Dulux Endurance but unlike Endurance, Dulux Easycare also has unique stain repellent technology which repels liquid spills, making them easier to wash away. When water based liquids hit the wall, our unique stain repellent technology turns the liquid into beads, which sit on the surface of the paint, making it easier to wash away. This product is perfect for living rooms, dining rooms, hallways, kids rooms and multifunctional spaces.